La Villa is located on the Chianti hills between Florence and Siena, an area rich in history and suggestive natural scenarios, the cradle of civilisation that have left an artistic and cultural heritage of incomparable value, surrounded by uncontaminated nature, lush vineyards tended as if the were gardens, century – old olive-groves and imposing cypresses. 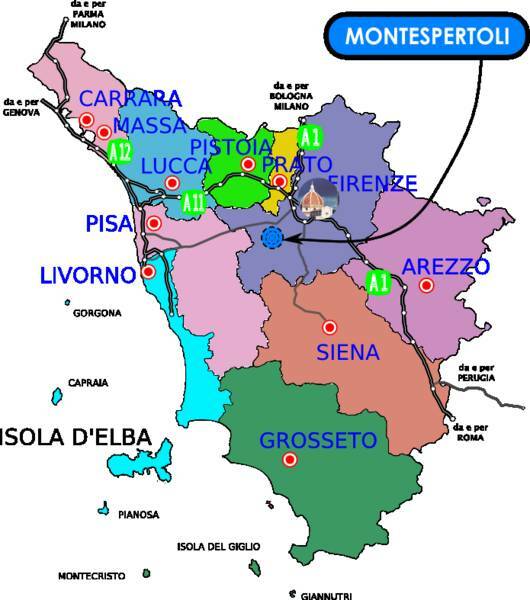 Florence, Siena, San Gimignano, Monteriggioni, Pisa and Lucca are all within easy reach. The villa has been furnished with great taste, having respect for its original structure. As we enter the house, We can admire the welcoming living-room with open beamed ceiling and big fireplace, typical of old Tuscan homes, and we can breathe in a pleasant, romantic and refined atmosphere in a very tranquil setting. TheVilla is surrounded by a large, nicely tender garden with a big swimming-pool and private parking place. Sport lovers may use the nearby tennis courts and golf courses. Our customers can choose separatly our apartments or can reserve the completly farm house as VILLA. The LIMONI apartment has all the modern comforts: SAT TV, washing-machine,dish-washer,oven,coffee machine etc. living-room, kitchen, a large hall with fireplace, with one doulbe sofa bed . The Rose apartment has all the modern comforts : SAT TV, washing-machine, dish-washer, oven, coffee machine etc.